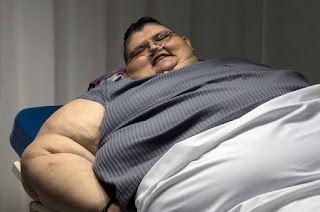 A Mexican man believed to be the world’s most obese plans to undergo gastric bypass in the new year and reduce his 590 kilos (1,300 pounds) by half, his doctor said Wednesday. “It’s surgery that is going to be done in two parts. That is because of the high risk of complications he faces. So it’s going to be done in two parts, six months apart,” Castaneda told reporters. In the first procedure, surgeons will remove more than three-quarters of the patient’s stomach. Castaneda wants him to lose 59 kilos in the first six months, which alone reduces his risk of obesity-related cancer by 52 percent. “Slowly but surely, I’ll get there,” Juan Pedro told reporters.